As an event holder do you hate it when the players do something that wrecks your plot? As a player, do you sometimes feel bored while ‘plot’ is being set up? Everyone hates those times when everything stops because there’s a need to patch the plot. Maybe a player did something unexpected. Or a villain lost when they should have won. These problems all stem from an attempt to predict the future. Something which humans are really terrible at. There is a better way. Improvisational Combat Larp. It is tempting to over think ‘plot’. It is very easy for players to do something unexpected and make all your preparations useless. Rigid plot structures will break every time. 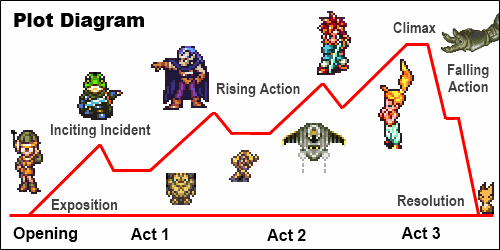 When plot point C is dependent on the players having item B, which is dependent on plot point A happening, your structure is too rigid. You can guarantee Item B will get stolen, no one will find plot point A until after plot point C occurs. Having to take time to repair broken causality between plot points is no fun for anyone. Follow the greatest advice ever; My Rule 1: Don’t write plot! Instead create characters, as though you were creating PC’s, a pool of potential NPC’s. Each will need distinct garb or affectations. An outfit, mannerisms, and equipment which helps tell the story of that character. Flesh those character out with the 5 things every character needs. Some of those qualities should align with the players, some may not. Imbue each NPC with the potential for a good story, but don’t have a set idea of what the resolution should be. During the event pick which ever characters from that pool seem like they should be out there. Assign players their parts, garb up the NPC team, and send them out. Then just let the people playing those characters breath life into them. Let them out to inhabit role and be in the world. Don’t force them to fight. Don’t force them to do anything. Don’t pick out endings for those characters, let it all play out. Some will die, some will live. The story of what happens is up to the interaction between the players and the NPC’s. Not determined ahead of time by the event holder. Record everything that happens. Spend time watching how interactions play out. Have the NPC’s report back and describe what happened if you couldn’t watch it unfold. After the event ask players what happened. What happened? What did they love? What did they hate? Now that the event has happened, write the plot of what occurred. Sum it up for all who attended (and for all who could not attend) and publish it. Get feedback from the players on your impression of what happened. If you, as the event holder, ever have to say “This is what happens”… You have failed. Remember show, don’t tell. And never hesitate to play one or two of the NPC’s yourself. Remember have a great time at your own event! You can ask me for input on your plot lines directly by tweeting @jspringfied211. You can comment, ask questions, and provide suggestions for this post on my Google Plus feed (it attracts less spam than my website). And finally you can find me on Ello.co as @larp.